I spent this past weekend in San Diego and dined at the (somewhat new) Quarter Kitchen at the Ivy Hotel located in the trendy Gas Lamp District. I'd heard good things and it was highly recommended by The Hard Rock. Normally I stay away from "fine dining" in hotel restaurants, but since amazing food wasn't the focus of the evening (we were more concerned with finding a dance club), I thought why not? Well ... unfortunately, we found a multitude of reasons ... as to why not. I'd like to preface this review by telling you I am always very grateful for any meal, no matter the quality, and I do recognize how VERY VERY lucky I am to have the opportunity to eat in a restaurant at all. I enjoy reviewing restaurants as a past time because food-art/fine cuisine is a true passion of mine, but in the larger scheme of things, I am so fortunate just to be blessed with 3 meals a day. That being said, it's time to put on my critic's hat. First impressions are not always incorrect. Around 5pm on Friday my friend Tami and I call to make a reservation at Quarter Kitchen for later that night, hoping we can be squeezed in by 10pm. They are able to take us at 8:30, or 9:00, or 9:30, and even at 10pm when we finally arrive. (Somehow, we lost track of time in Nordstrom's ... crazy I know.) Clearly they are not booked despite the fact every other place we drive by is teeming with people. An empty restaurant is not a good sign but we ignore this since our stomachs are on empty. We walk into a grand space with heaven high ceilings and a modern vibe that makes you feel chic and cool just to be dining there. Our waiter is nice but not knowledgeable about basic menu questions. I order a glass of Sauvignon Blanc which is excellent and she has a Riesling, also very good. The wine, FYI, is the highlight of the entire experience. An amuse bouche arrives ... watery potato leek soup drizzled with olive oil. This little gift from the chef was CRYING for sodium and or any flavor at all. We order truffled, leek empanadas with queso blanco and truffle dipping sauces. I can see the black perigord truffle slices in the lukewarm, coagulated gravy-esque sauce (also needing salt) but the slightest hint of truffle flavor is difficult to make out ... quite a feat considering the flavor of truffle is so potent and unique. The empanadas seem to be made in-house but possess minimal flavor and remind me of pop-tart dough stuffed with mushy vegetables and cheese. A caprese salad arrives next ... not horrible but nothing an amateur cook could not make at home. The VISION of heirloom and fried green tomatoes with 25 year old balsamico described on the menu, somehow does not translate to the plate. When a restaurant serves an amuse bouche, it sets a certain tone for the entire meal. At very least I'm expecting juicy, succulent tomatoes, soft rich mozzarella with a slight tang, and memorable balsamic. We are served average at best tomatoes, what tastes like cheap mozzarella, and wilted shreds of basil. We share an entree,which they split for us and that is gracious service. Blackened Hamachi seared rare with Togarashi, wok fried vegetables and a spicy red miso sauce. We are not able to try anything beyond the first bite of Hamachi which is so fishy we send it back, order 2 more glasses of wine, and get the check. Oh, we also try a side of grilled asparagus with shaved Parmesan which is fine. Normally, in a high end restaurant, a manager is sent over when guests are so clearly unsatisfied, but no one seemed too concerned. Oh well. I believe this place has potential ... the exhibition kitchen is gorgeous. Perhaps they are just working out the kinks many new restaurants experience. We go party all night anyway and have glorious French Fries at 2am. The following morning we ate at The Bondi, an Australian Cafe with phenomenal decor and excellent food brimming with flavor. I would have gone back to the Oz inspired cafe for dinner if we'd stayed another night. I've heard from more than one foodie that the neighborhood on Pico between Fairfax and Hauser is flowering into a boutique restaurant haven. I made my way down there this past Sunday to check out Bloom ... a little cafe that prides itself on seasonal, healthy fare and going green. We sat outside on the back patio which was very cool in a retro Jetson's sort of way. The bright white space is accented with orange tables and blue inset windows. Strings of lights hang from the canvas draped overhead and I bet the patio is especially charming at night. The place was packed! We ordered 2 cafe au laits and tap water, which came chilled, sans ice, and infused with cucumber. The cups looked like plastic but were made from corn. Neat! This was by far the best tap water experience I've had in a restaurant. For brunch, I decided on the poached eggs on raisin walnut bread. The food took awhile to arrive but was well worth the wait. My eggs were perfectly soft and the combination of savory tomato coulis and goat cheese spread over the soft sweet raisin bread created heaven right there in my mouth. I loved that they were so forward thinking with the flavor combinations. My boyfriend acutally cringed at the thought of goat cheese, tomatoes, egg and raisin bread all together, but once I convinced him to try a bite ... he ate half my breakfast. He ordered the 222, which was good, but not as amazing as my dish. The 2 buttermilk pancakes were fluffy and flavored ever so lightly with orange. The eggs were ordered over medium but came out WAY OVER EASY so we sent them back. The second time around, they arrived perfectly soft boiled, but by this time he was full. The star players in the 222 were the sausage and syrup. The meat was well spiced, juicy and when dipped in the warm maple syrup with orange essence ... I knew that I'd found another thing to be addicted to in LA. Oh and BTW, the prices at Bloom are VERY reasonable, especially for such quality food. Low-fat milk instead of whole and they were pretty good but after one day became dry. In bowl of electric mixer, using paddle, cream butter and Matcha until combined and the mixture is a tea green color. Add half of powder sugar, milk and vanilla to bowl. Mix on low, then move to medium speed. Slowly add remaining powdered sugar until frosting reaches desired consistency. Beat frosting on high until fluffy. Frosting should be quite thick but smooth enough to pipe onto cupcakes. Making frosting this thick will prevent you from having to refrigerate cupcakes. Use pastry bag fitted with round pastry tip, about 1/2" in diameter to pipe frosting onto cooled cupcakes. I decorated with pearl dragees. Store in air tight container. It's important to give restaurants a second and possibly third chance, just as it is with people. I tried Coupa Cafe twice when they first opened in Beverly Hills and wasn't impressed. Early this week, boyfriend and I were lamenting over how Beverly Hills needs a few better breakfast spots. Since he'd never been, we walked into Coupa Cafe and were so deliciously satisfied by the time we left, we returned the next morning! They have these addicting Arepas and phenomenal coffee from Venezuela. Arepas (for those who don't know, I didn't) are a very popular Venezuelan snack food, especially for the late night party crowd. We go for pizza, or possibly "street meat" (aka hot dogs on a cart) at 2am. Venezuelans eat Arepas. They are little corn cakes that remind me of a Pita/English Muffin hybrid. When sliced in half, they are very thin, a little crispy, and you can fill them with anything you'd like. They become a perfect little sandwich, about the size of our Egg McMuffins, but much tastier! On visit #2, Derrek ordered the Breakfast Special Arepa, eggs with bacon and Gouda, as well as one with turkey, goat cheese and spinach. I customized mine with egg whites, sun dried tomatoes, and light Gouda cheese (trying to be healthy). All three were wonderful, but the Breakfast Special is great if you're hungover! Now let's talk coffee. Among my favorite places in BH to get my morning ritual Cafe au Lait are Frittelli's, Ingrid's, and Le Provence. COUPA CAFE is now my coffee obsession of the moment. I always knew my heart would be stolen my someone or something in South America ... I guess it's the latter :). I asked if they had a mild coffee and our waiter suggested the Caracas. Not only did my Au Lait arrive looking red carpet ready, but also had velvet-like mircofoam, the tell tail sign of a fine barista. The coffee was rich, decadent, and smooth, as promised. 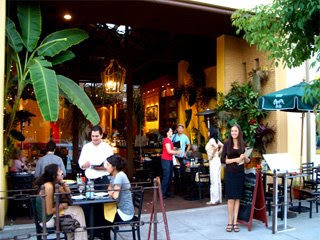 Coupa Cafe also has free WiFi, beer and wine, a cute outdoor patio area and a warm fireplace inside. Their flagship cafe is in Palo Alto, Ca. Peel and chop garlic. Saute in large soup pot with grapeseed oil until golden brown. Turn off heat. Clean and coarsely chop all vegetables. Just an FYI, you only use the light green and white part of the leek for this recipe. Make sure to wash them really well as they tend to hold a bit of dirt inside. Place all vegetables in pot with garlic except for cauliflower and cabbage. Pour broth over veggies then add water until covered. Bring to a boil over high heat then add spices using wooden spoon to combine. Simmer, uncovered for 40 minutes. Add cauliflower and cabbage and cook for another 15 minutes. Serve soup hot with a dollop of plain yogurt on top. Salt to taste if necessary. This huge pot o' soup should last 2-5 days. I love French Women Don't Get Fat (FWDGF) because there's not a specific meal plan I have to stick to. Rather, Guiliano offers many recipes and general guidelines for what she calls "recasting" your eating habits over a 3 month period. Today I made a lovely, petite breakfast with plain FAGE 0% fat yogurt, toasted flax seed, brown sugar, cinnamon, and grapes. I also drank a small cafe au lait with skim milk; normally I order a medium . I'm making small but doable changes just like the book says! YAY :) FWDGF recommends eating 2 daily servings (about 1/2 cup each) of plain all natural yogurt since it's satisfying and really good for you. I sliced up some green grapes then combined 1 cup yogurt with 1 tablespoon brown sugar, 1/2 tsp cinnamon, and 1 tablespoon golden flax seed. Top the yogurt off with the grapes for a delicious, easy breakfast with protein! I set the table for one and sat there eating my breakfast, not watching TV ... just enjoying my first meal of the day. It felt a little weird, but it's nice taking a moment to eat and pay attention to what your eating. Far better than rushing out the door, banana and protein bar in hand, not tasting a morsel as it goes down. It is possible to be overly flirtatious with food? Well, my "skinny jeans" seem to think so. I'm afraid I've been flirting with a few too many foods, too many times a day. Oops! Oh well, it was bound to happen sooner or later. 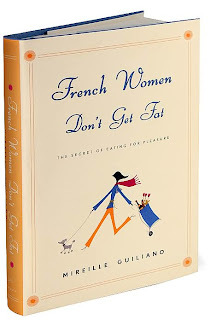 Enter "French Women Don't Get Fat," by Mireille Guiliano. This book came out in 2005 and reads like a novel, but it's actually a book on how to lose weight in a very reasonable, doable way ... the French way. Now, French people are the original foodies (Italians may disagree) and thus, would never shun great food or live on protein bars and frozen meals. GROSS! So, I've decided to revisit this excellent little book, which focuses on conscious eating, the opposite of mindless eating, which has become ever so popular in America. In short, you start out with a 2 day diet of homemade soup, then follow with three months of wonderful, albeit healthy, mainly homemade meals. You must agree to eat your meals sitting down at a table, not watching TV or talking on the phone. When you eat you focus on just that, eating. You taste the flavors and enjoy each bite. You take your time and eat slowly. You notice the first signs of being full and push the plate away, even if you're not a member of "the clean plate club." You also decide which foods are most likely the culprit for your weight gain. For me ... wine and sweets, so for three months, I'll keep those two items to a minimum, meaning weekends only. I began this "lose five pounds" process 3 days ago and I have to say, it's AMAZING how a small amount of really wholesome food can be so satisfying. I was out to lunch the other day, ordered a chopped veggie salad, dressing on the side, and made the conscious decision to eat 1/3 of it and then decide if I was full, which I was. Normally I would have dove right in, munching away, paying more attention to my boyfriend than my meal. This time, I tried to enjoy each nuance, each ingredient and guess what? The meal was so wonderfully satisfying, I didn't think about food again until dinner! If you're a food lover who wants to shed a few pounds, this is the easiest diet plan around. I finally meandered over to Silver Lake to experience the much talked about coffee boutique, LAMILL (pronounced lah-mill). This is not, let me repeat NOT, your average, cater to the masses, grab your daily cup o' Joe and go coffee shop. No ladies and gentlemen, LAMILL takes the art of coffee to a pristine new level. Their caffeinated concoctions have been carefully calculated, formulated and are ever so thoughtfully constructed right before your eyes. This is a place to visit when you want to indulge in a divine brunch and linger over ridiculously decadent coffee that you’ll crave for the rest of the week. If I lived in Silver Lake, this spot would become part of my lazy Sunday morning ritual. At first I was curious … why didn’t this opulent coffee palace open somewhere chichi like Beverly Hills? Why boho-chic Silver Lake? This seems to be an ongoing blog debate. My 2 cents? I think it’s the distinctive artsy types, the gastronomic gurus, the “French palate” patrons who will truly recognize and appreciate the quirky artistry occurring daily at LAMILL … and those people are found in neighborhoods like Silver Lake. In BH, people would have given this fantastic establishment plenty of business without scoffing at the $5 latte, but I live in Beverly Hills and let me tell you, a restaurant does not have to serve high quality food to be a success in the 90210 area code. (Not always, but often, BH diners are far more concerned with who is eating at the restaurant than with how the food actually tastes i.e. the Farm of Beverly Hills, Il Pastaio, and Mr. Chow.) Silver Lake is unusual as is LAMILL and I think they compliment each other. When you walk in, there’s a tempting pastry case filled with scones, muffins, croissants, etc. Before we even sat down my boyfriend ordered a canele to be sent to the table. The two room restaurant was bustling with people high on platinum caffeine. The eccentric décor almost out shines the coffee … almost. Color scheme: gold brass, deep teal, robin egg blue, grey black and blood red. Picture custom French wall paper depicting mythological scenes and vintage chairs covered in exotic, vinyl animal skin such as ostrich and crocodile. It’s anything but boring and somehow sets the right mood for coffee chemistry. Sitting at our window-side table for two, we perused the bible of a beverage menu and munched on the incredible canele. The outside was terrifically crunchy with a soft, creamy center similar to vanilla bread pudding. We wanted to try the coffee spheres, but were told they were still in the creation phase and not yet available. (I felt like I was in Willy Wonka’s Coffee Factory.) As alluring as the “Jelly Doughnut Coffee Drink” sounded, we both ordered our usual, café au lait with skim milk, just to test this $5 version against the hundreds we’ve had elsewhere. Derrek wanted to add house made chocolate sauce and real whipped cream to his au lait. Uh oh! Order something not listed on the menu? Confusion ensued. Our very patient, sweet waitress summoned a guy in charge of coffee creation and he kindly explained that their drinks are made from precise recipes with exact ratios of milk to coffee etc. (BTW there was no attitude while explaining why they are so particular about the drinks … each person was gracious and sincere.) Much to my surprise, he finally agreed to bring the chocolate sauce and whipped cream on the side. Both were devastatingly delicious and the chocolate sauce was far closer to a velvety ganache. To achieve the perfect 50/50 ratio that makes up a café au lait (half drip coffee, half steamed milk) the coffee creator poured both the coffee and milk simultaneously, into the cup, table side. Necessary? Nope. Elaborate, indulgent, and fun? Absolutely! My café au lait was smooth and creamy with no trace of burnt beans whatsoever. At LAMILL, the coffee is not pre-made. Each cup is brewed as it is ordered. Can you say FRESH? My only qualm was that by the time everything was poured, admired, and sugared, the beverage had lost that piping hot quality. Knowing the menu was created by the esteemed Chef Michael Cimarusti of Providence, I was equally excited for the food. I ordered baked eggs that arrive with a sinfully generous amount of fresh crab meat on top, accompanied by perfectly crisp, perfectly buttered, toast. (Perfection is the predominant theme if you’ve not noticed.) The dish was sprinkled with chives which I assumed were just a garnish, but they added a piquant flavor profile to my already heavenly breakfast. Derrek opted for scrambled eggs with smoked salmon, asparagus, and chives … a sumptuous display of simplicity at it’s finest. I floated out of LAMILL feeling blissful and content, with a sheer appreciation for the effort put forth to create a superior coffee+food experience in Los Angeles. (I did return weeks later. The “kinda like crème brulee” banana dessert was average at best but the liquid center lollipops are luscious).